Oil prices are in a bear market. Both Brent (the international price benchmark) and WTI (the American benchmark) have declined more than 30% from 2018 highs. Where does oil go from here? We see oil prices near their nadir and a potential price recovery opening up opportunity for investors. One reason oil prices may be near a bottom: production appears set to decline after oversupply concerns contributed to the recent rout. The Organization of the Petroleum Exporting Countries ( OPEC ) and its partners are expected to cut production at their meeting this week in an effort to help stabilize prices. OPEC curbs since 2016 have had that effect, as shown above. Brent popped on news of the first cut in November 2016 and stabilized with curb extensions. We estimate a cut of roughly 1.2 million barrels per day this round. This is in the middle of the consensus range, as we see U.S. production growing slightly less than some market participants, but enough to help manage oversupply, in our view. Pressure from the U.S. government to avoid high prices may limit the size of the cut and could inject some downside, however. Global oil inventories saw the largest quarterly increase in three years last quarter. Oversupply concerns are poised to fade, however, with the potential OPEC cut, expiring Iranian sanction waivers and production decreases from many U.S. producers amid lower oil prices. Yet the recent selloff wasn't only about supply. Other contributors: Fears of weakening demand amid worries about a global growth slowdown have played a role, while price declines have been exacerbated by market participants unwinding long positions built on earlier speculation of higher oil prices, evident in U.S. Commodity Futures Trading Commission data. Our BlackRock GPS shows solid, albeit slowing, global growth, which should underpin near-term demand and market sentiment. And refiners' recent weak demand is not alarming, in our view, as many refineries were shut down for seasonal maintenance. Energy equities and debt have suffered along with crude to varying degrees. Energy stocks under-performed spot oil prices at the beginning of the selloff but recently have declined only about half as much. Yet we believe the recent price reset may offer an attractive entry point as capital discipline and balance sheet management remain priorities for many energy companies. We see some opportunities for investors willing to stomach volatility. Within energy equities, we prefer midstream firms focused on oil storage and transportation. Their high-yielding nature may offer a buffer in a risk-off environment. We also favor oil field service companies longer term, as U.S. shale is needed to help meet global demand in the 2020s. In fixed income, we prefer midstream companies in the investment grade space and selected high-quality exploration & production firms. More broadly, global equities appear less sensitive to oil price fluctuations than in the past. An oil price rebound driven by higher demand amid above-trend global growth may be good for risk assets. A supply adjustment that puts a floor under oil prices may not have as widespread an impact. 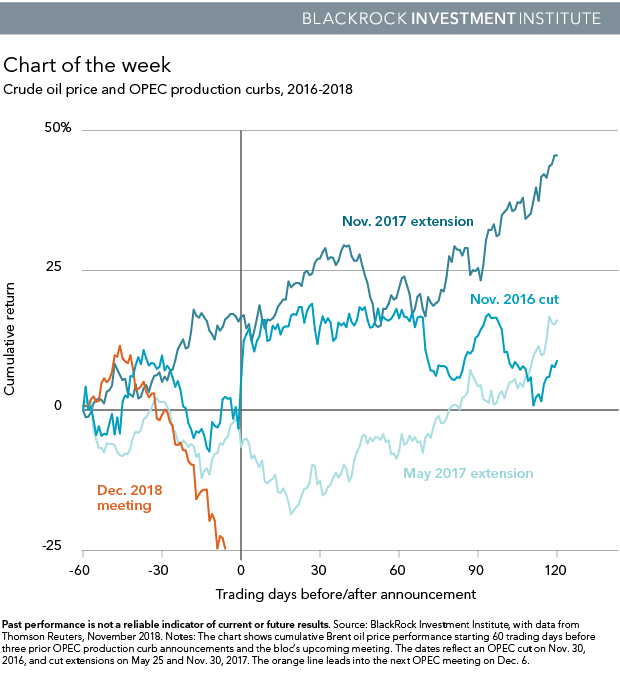 Stabilization in the oil price should help global markets going forward, but we expect there will be winners and losers, particularly in some emerging markets. Markets in oil-exporting countries could benefit from stabilizing prices, though a big bounce could hurt markets in importing countries with current account issues. Read more market insights in our Weekly commentary . Richard Turnill is BlackRock's Global Chief Investment Strategist.